Hello, I’m new in Affinity. I seem to be having a problem with the paint brush tool. here are the steps I did before the brush stopped working. I find it odd that the brush is not working only on this file. I’m using an ipad 2018. 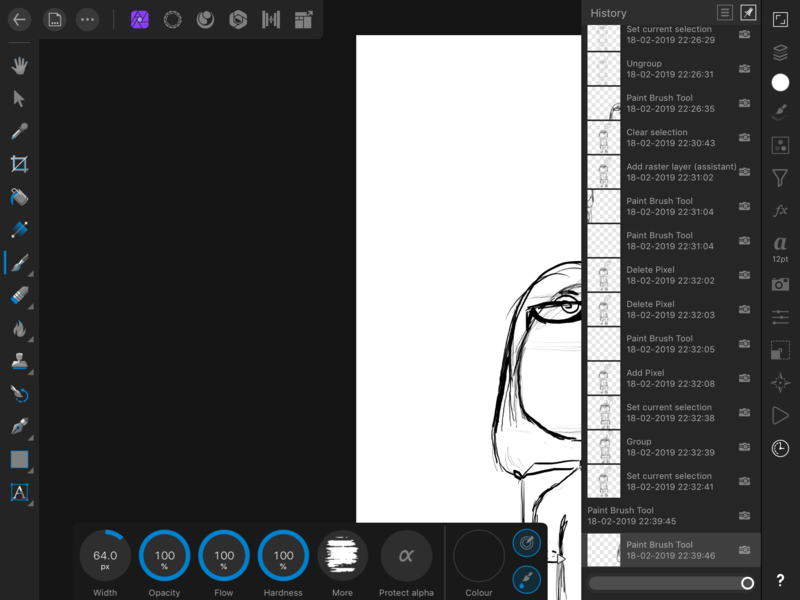 Sometimes brush adopts colour studio colour(white), no context menu colour , black). Check you are not painting with white. I've tried changing it as well and it ain't working. Remember when we switch files the brush setting retains? I've tried it on other files and even changed colors amd it's working. What's funny is even if i go back to the history even before the group happens, the brush no longer works for this file. Maybe mods can look at the file for you. You could attach the file here. Or if you can't do that because it's proprietary one of the staff members can supply a private upload link when they see this topic. Would you like to attach the file here or if you would rather I can send you the link? thanks for actively helping me out. and i don’t mind uploading it here. If you turn off the wet edges setting (brush with drip below) on Context menu, the brush works (at least for me). Not sure why this is, maybe related to brush you are using. Maybe Mods can explain why. thanks DM, at first it wasn’t working with mine when i followed your step. but I think I’ve accidentally fixed it when I colorpicked the white then black. it’s now working even with the wet edges turned on. I hope the devs could look into this bug?